A big screen with a large resolution demands the best quality wallpaper you can find on the Internet. An excellent idea you can explore is setting a video as your desktop background if you have the resources to spare. Windows doesn't have anything to offer when it comes to video backgrounds, but you can get a third party utility to make this a possibility. An excellent example is imDesktop, which can apply a video on your desktop at a moment's notice. It gives you access to a wide range of high-quality videos and static images for your desktop, so you can give your workspace a fresh new look. imDesktop is free to try without any noticeable limitations so you can see its capabilities for yourself. It works on Windows 7 and all later editions up to Win 10, and it doesn't require any third-party tools or services to be installed on your machine. It runs straight out of the box, without using too much memory or processing power, but you will still need some extra resources if you plan to play videos as desktop wallpapers. When launched, the software will immediately apply a video wallpaper on your desktop. Its user interface can be accessed through a system tray icon, and it presents strictly what you need to switch between different backgrounds and tweak a few settings. The program comes with a series of sample backgrounds, which you can apply on your desktop instantly, with a single click. Of course, you can get more video or static backgrounds from the developer's website, which you can reach at a moment's notice through an option on the program's user interface. imDesktop can use ordinary MP4 videos as your desktop background, and it can even play back their audio tracks. You can add them to your collection through a simple browsing option or by simply dragging and dropping the files over the interface. What's more, the software lets you create multiple playlists, which is perfect if you want to go for a certain theme. 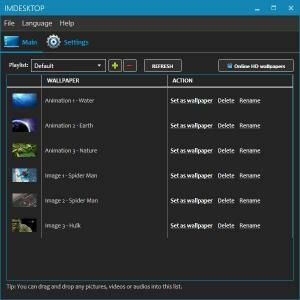 Taking the high-quality video backgrounds on imDesktop's website, you will probably have more than one video in your collection, which is why you can set the application to change your wallpaper automatically every few minutes, hours or days. If you let imDesktop run quietly on your system, you can enjoy a relaxing waterfall or rain, complete with sounds, or other beautiful scenes, directly on your desktop. You can use videos as your desktop wallpaper. The software doesn't require any special tools or complex settings to work. It gives you access to countless backgrounds, and it lets you create playlists. Certain hotkeys, like Win+Tab, will disable the applied wallpaper and you will have to restart the application. You can download imDesktop free here.